The Intel HD Graphics 5600 (GT2) is an integrated graphics card of the Broadwell generation. It can be found in standard voltage CPUs (47 W) and offers 24 EUs (Execution Units). 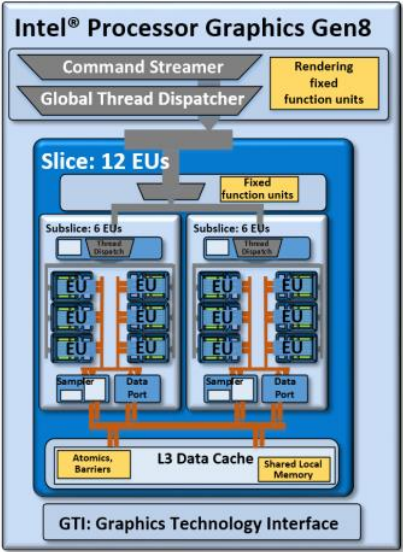 The clock range may depend on the model it is built into (Core i7-5700HQ: max. 1050 MHz with Turbo Boost). The HD Graphics 5600 represents the mid-range version of the Broadwell GPU family and consists of one slice with 24 EUs. Beyond that, there is also a low-end variant (GT1, 12 EUs) as well as higher-end models (GT3/GT3e + eDRAM, 48 EUs). 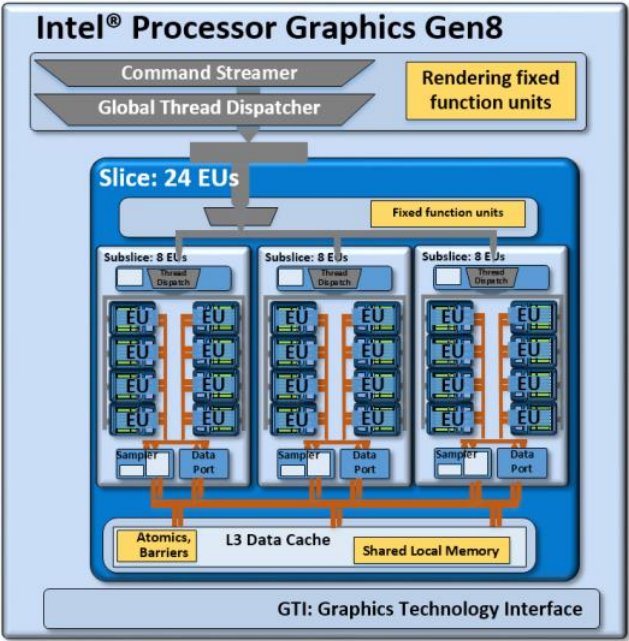 All Broadwell GPUs support OpenCL 2.0 and DirectX 12 (FL 11_1). The video engine is now able to decode H.265 using both fixed function hardware as well as available GPU shaders. Up to three displays can be connected via DP 1.2/eDP 1.3 (max. 3840 x 2160 @ 60 Hz) or HDMI 1.4a (max. 3840 x 2160 @ 24 Hz). HDMI 2.0, however, is not supported. Thanks to its improved architecture and the additional EUs, the HD Graphics 5600 is about 20 percent faster than the Haswell-based HD 4600 (20 EUs), but still somewhat slower than dedicated low-end GPUs like a GeForce 920M or Radeon R7 M360. Most games as of 2014/2015 will be playable only in low settings (and sometimes not even that). 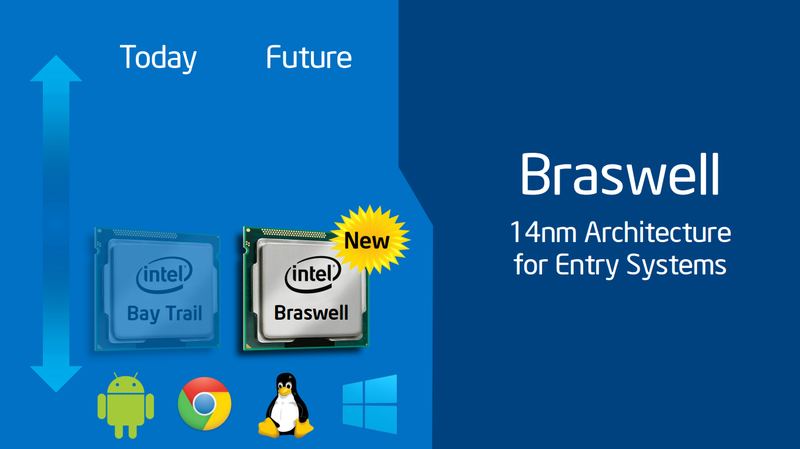 The whole Broadwell chip is specified at 47 W TDP (i7-5700HQ) and therefore best suited for notebooks 14-inches in size and above. We tested the power consumption of the GPU with HWInfo sensors in a Core i7-5600HQ (MSI GP62). Idle on the Windows desktop the HD 5600 needed on average 0.04 Watt. Running World of Warships in high details, 9.6 Watt were used by the graphics card (whole CPU needed 41 Watt). In comparison, when we activated the dedicated GeForce 940M, the GPU part needed 0.4 Watt and the whole CPU 29 Watt.